Water is a finite resource and those of us in today’s agriculture industry understand how precious it is. The price of irrigation water is increasing rapidly; regulations on groundwater use are developing; the quality of our irrigation water is degrading and threatening our crops. These are just a few of the concerns that modern farmers must face when managing water. As stewards of the land, farmers must ask a series of questions to manage their irrigation water efficiently: How often should I irrigate? When should I irrigate next? How long should my irrigation events run? How much water does my crop need between irrigation events? How efficient is my irrigation application? OnFarm can help answer these questions by providing the tools to assess field and crop conditions. Growers may use soil moisture data to identify soil conditions or water penetrability. 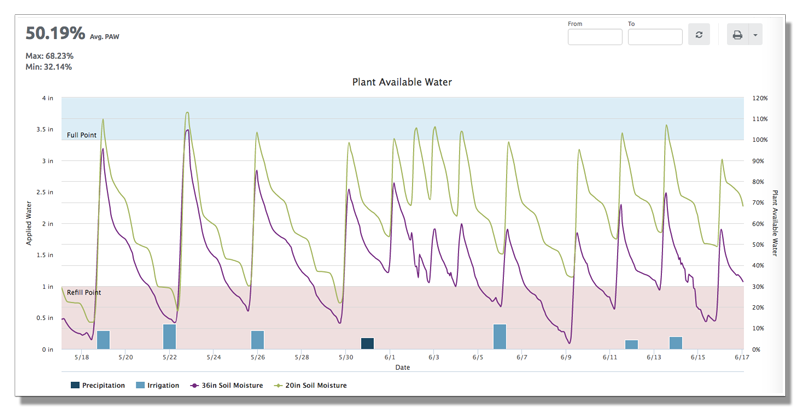 A Plant Available Water model (PAW) is used to predict when the next irrigation event should be scheduled and how much water should be applied. OnFarm’s weather forecast service offers insight on the current field conditions and the expected crop water use. For more information on the ways that OnFarm can help you manage your water, please contact us at support@onfarm.com. To get started with your free OnFarm account today, visit www.onfarm.com. Sign up with OnFarm today; simple to start, no commitments.